This is a game that should make us feel at home in the Conference. A game against one of our favourite whipping boys, Exeter City, makes you feel like you're back in the 3rd Division. 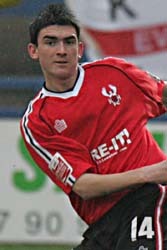 We went our separate ways back in 2003 when City were finally relegated and that was also the season that we did the double over them beating them 4-3 at Aggborough and a memorable game down in Devon when we won 5-2 with a hat trick from the legendary Bo Henriksen to add to the two he grabbed against them in the earlier victory. As we all know now we have joined them again and it's time to re-ignite the memories of such marvelous victories once more. Following Saturdays amazing 2-1 win against Woking, when the appearance of substitute Taiwo Atieno changed the game in our favour, we now have the confidence to get a result at St James Park. On Saturday the defence was a much improved unit to the one that saw us get relegated and, apart from one bad error that led to the Woking goal, the presence of Daryl Burgess and Wayne Evans gave us a more solid look than in the past. Up front Iyseden Christie was a menace throughout the game but by being forced to play a lone strikers role up front was asking too much of him so the expected start for Atieno against City could be the catalyst that he needs to start cracking in some goals of his own. On the injury front it's still just Chris McHale with the broken foot and that should be it. I expect to see Wayne Graves on the bench in place of Atieno now that he should be nearing match fitness following his recent arrival at Aggborough. Exeter City got their season off to a good start with a 2-0 win at Gravesend but in the process lost Les Afful for the game tomorrow following his sending off soon after coming on as a sub for the injured Dean Moxey. City fans will be hoping that Moxey is fit otherwise there could be a selection problem with no obvious replacement for him. The former Harrier, Billy Jones, didn't play for his new side against Gravesend following a pre season leg injury and he's not expected to be fit for our trip down. So we should be looking forward to a good, but tough, game tomorrow and I feel that we can come back with at least a point and if we're really lucky another 5-2 win and a hat trick from Taiwo Atieno - the new Bomber. Danby, Lewis, Hatswell, Burgess, Evans, Burton, Jackson, O'Connor, Fleming, Graves, Hurren, Russell, Penn, Christie, Atieno, Hollis, Sheldon, Wilson, Blackwood, Thompson. Rice, P Jones, Hiley, Sawyer, Gaia, Todd, Taylor, Cronin, Farrell, Challinor, Phillips, Flack, McConnell, Buckle, Edwards, Clay, Moxey, Seaborne, Leliuga, Vinnicombe.